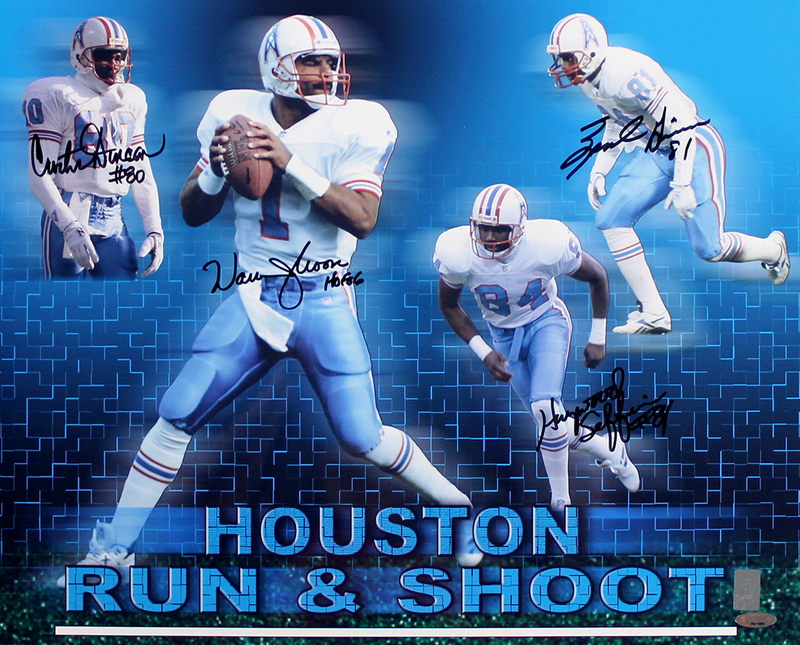 These Houston Oilers 16x20 photos have been personally hand signed by five members of the Houston Run & Shoot offense, including Warren Moon, Haywood Jeffires, Ernest Givins, and Curtis Duncan. Each autographed photo includes an individually numbered TRISTAR Authentic hologram, as well as a Warren Moon authenticity hologram. These five players were members of the Houston Oilers team during its “Run and Shoot” era of the early 1990s. The Oilers were one of the most successful teams to execute this offense. Warren Moon was a 9x Pro Bowl selection and led the NFL in passing yards twice; he was inducted into the Pro Football Hall of Fame in 2006. Curtis Duncan played his entire seven-year career with the Houston Oilers, and had his best season in 1992 when he caught 82 receptions for 954 yards. Ernest Givins was a 2x Pro Bowl selection and was named to the 1990 All-Pro team. Haywood Jeffires was a 3x Pro Bowl selection, led the AFC in receptions in 1991 with 100 and was selected to the 1992 Pro Bowl after he rushed for 1,226 yards and 7 touchdowns that season. 130 points will be rewarded to you when you buy this item.